Beim Aufräumen in der Küche versteckt hinter den Tees noch ein Glas Darbo Pflaume zu finden, das ist Glück. 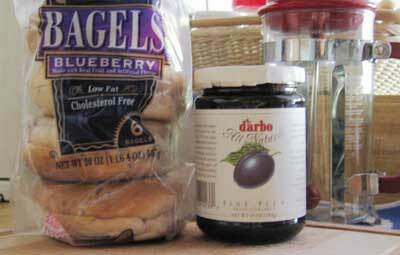 Dank der Kombination Blueberry Bagel und Plaumenmarmelade ist das Frühstück gerettet. Received my legal DVD copy of Hero from Malaysia today in the mail, 3 months before the film will be shown in movie theaters over here. One of the best movies in a long time, and another reason to love the Web! ein herzliches Willkommen den LeserInnen der Brigitte. Classical pianist Christopher O'Riley is best known for his interpretations of music by such composers as Stravinksy and Ravel. But on his latest album, True Love Waits, he transforms the compositions of Radiohead. Listen to an interview with O'Riley on NPR. Read a review on BBC.